Over the decades, from humble Mini beginnings, Crayford progressed up market through BMC, Ford and Audi. Then they reached a peak in their conversion skills when they started a long association with Mercedes Benz, although it did not start well. Mercedes were very protective of their brand and were uncooperative at first, even hostile to the point that they tried to legally stop the first Crayford conversion from being shown in the London Motor Show at Earls Court. They also opposed Crayford’s use of the MB 3 pointed star logo on Crayford brochures and paperwork. Eventually though, Crayford won around Mercedes with the fine quality and demand for their conversions. Mercedes even began endorsing the conversions and allowed full warranties to be honoured on Crayfords work. Crayford also built a one-off W116 S Class, four door convertible, for a head of state in Kuwait. It was damaged during shipment to Crayford, by Kuwaiti Dockers. A letter to Crayford from the Royal office threatened that the offenders, if found, would pay with a hand. Crayford then went on to build a Mercedes 600 Pullman convertible, not a Crayford design, it was built in several counties by different coachbuilders, you could apply to MB in Stuttgart for a set of plans. Crayford spent a year jigging the car before the roof was cut, it took up half the factory floor space for two years, they where glad to see it go. Dictators like Idi Amin in Uganda loved these monster convertibles. The Crayford one was recently for sale at £250, 0000 dollars. 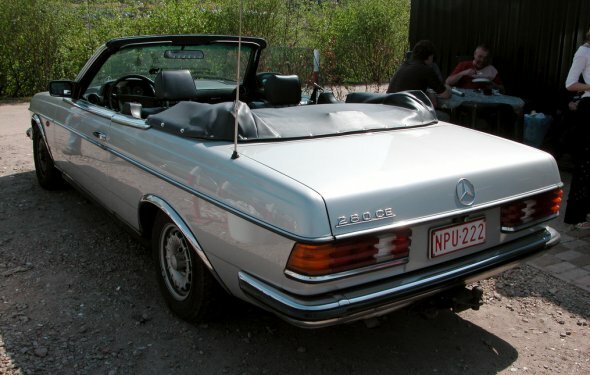 Crayford also became involved in the development of bullet proofing Mercedes Benz cars. This was new territory for everyone in the industry. It took Crayford into some uncomfortable areas, and shady characters with go betweens. One client wanted to machine gun his car with the designer inside it. If a car or windscreen was test fired the client paid twice, before and after, for the replacement. Crayford did not stay in the bullet proofing business for long, selling spare stocks of Kevlar in the Exchange & Mart. Crayford fared much better selling Mercedes Estate conversions of the W108, 114, 116 and S Class cars. The most unusual of the many varied 114 estates converted had to be the extra long wheelbase 114 stretched estate, aptly it was named "The Dachshund" but Mercedes Benz took exception to one of its cars being named a dog, and started sabre rattling. They also wanted Crayford to refrain from putting the Mercedes loggo on its brochures despite giving full Mercedes warranty to the Crayford conversion. Crayford agreed not to print any more, but it had already printed all the brochures it needed. The Crayford Dachshund could accommodate 9 or 12 people (three children facing rearward) plus luggage. The only example sold, It cost £6, 991 when new and still survives today with a club member in Oxford. Mercedes had caught on and produced its own estate based on the compact W123, but when it launched the all new 'S' class in 1974 it left a niche that Crayford would fill, there was no estate car. Crayford had done a few of the of the outgoing pre-1974 stacked headlight 'S' class, including a hugely expensive 6.3 V8, 300 SEL Estate. The all new 1974 'S' Class and the Crayford sibling "s" Estate were very advanced cars and the Crayford was retrimmed with Mercedes Benz materials to the point that you could not tell them apart. It was expensive, and sold to the rich and famous. Sophia Loren ordered one with a custom built, hinged dog guard in the rear so she could carry all her Poodles in safety. A base 280 E Estate cost £9, 900, but a fully loaded 350 SE or 450 SE Estate could double this. Fifteen are thought to have been made from orders taken at its show launch.